Supa Simple Rank Checker is a 100% free and full (no trail etc) desktop application that will sit in background checking the search engine position (ranks) of all your keywords on both Bing and Google. You can enter your keywords and website(s) and it will check every day or you can run manual updates whenever you add new keywords or think there might be some movement in your rankings. See the daily changes for each keyword, see each keyword compared to a week or month ago and see each keyword visually with graphs. You can import lists of keywords and export ranking results. Discover an easy way to see where your site ranks in Google ,Yahoo, and Bing - in a few seconds! RA SEO Evaluator gathers all essential website ranking info including, Google Page Rank, Alexa Traffic Rank, IP Information, Host Status, webpage title, meta description, meta keyword and other various SEO parameters. 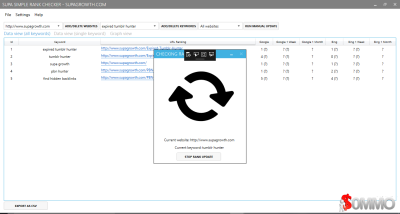 RA SEO Evaluator is a Light weight, powerful, Time-saving application which supports multiple URL check at once and exports results into CSV or TSV. You will get all the SEO parameter in just few seconds. Page 1 Genetics uncover the secrets to Page 1 Google Rankings and Let's You Out Rank Your Competitors 99% of the Time. Analyzing what the top 10 ranking sites are doing and then optimizing your own has been a little known technique SEO service providers have used for years. It's Important to reverse engineer both Onsite and Offsite factors. You will now know exactly what the top 10 ranking sites are doing both onsite and offsite and know exactly why Google is ranking them and be in a position to do exactly the same. So when wanting to optimize for a certain keyword instead of leaving your rankings to chance. Just have a peak at what Google is already ranking in the top 10. This way you can be 100% sure that your doing things the way Google wants you to . Rank Reporter 5 - Automatic search rank tracking for Google, Yahoo and Bing! Automatically track your website's search rank in Google, Bing and Yahoo!Rank Reporter from Inspyder is an easy to use application for keeping track of your website’s search ranking. Rank Reporter automates the tedious process of manually monitoring website search placement. Just enter your URL, some keywords and click Go! Rank Reporter will take care of the rest. Power Search 5 - Powerful website scraping and searching made simple. Search and scrape virtually any website!Power Search from Inspyder is the easiest way to search and scrape data from virtually any website. Crawl websites to look for specific words and phrases, or use Power Search to scrape and save data using our innovative point-and-click interface. Power Search enables you to quickly search a website for content that is not normally indexed by search engines. Searching within a website’s HTML code, Power Search provides powerful query and scraping tools to help to locate and scape the data you need. InSite 5 - Find broken links and spelling mistakes before your customers do. Find broken links and spelling mistakes fast with InSite.Check any website for spelling mistakes, broken links and SEO problems with InSite; the gold standard in website analysis software. It’s easy to use, yet powerful enough to handle complex sites. InSite is affordable, feature rich and can check your entire site in minutes. OrFind 5 - It's never been easier to detect and remove unused files on your website. Find and remove unused files on your webserver.OrFind is a powerful desktop tool to easily detect and remove unlinked (or “orphaned”) files from your website. OrFind works by checking every link on your website and comparing those links to the files stored on your server. The result is a clear view of the files your website uses (accessible files) and which ones it does not (orphaned files). As your website is updated over the years, old and unused files build up like dust. These files waste space, create security risks and cause SEO problems. Finding out which files are needed and which can be removed is no simple task; fortunately OrFind is here to help.